The palm trees outside of the apartment are craping the windows making it very hard to sleep at night. if these could be trimmed that would be great. Thank you so much for bringing this to our attention we will certainly look into getting that taken care of for you. You are able to renew your lease at anytime once recived from managment. If a resident decides to vacate they are required to provide a 60 day notice to vacate in writting to the leasing office. Our main office is located at Palma Ceia Apartments at 2402 Teresa Cir, Tampa, FL 33629. I look forward to speaking with you soon. Good afternoon, could I send this via fax or email? I'm so glad we were able to connect on the phone today. 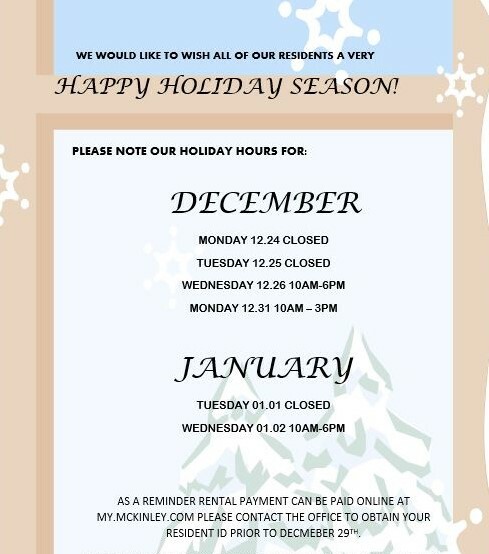 Read more about Rent Reminder! Please contact me about this. I had a credit on my account which covered Feb rent and partial of March and was still assessed a late charge for 100. I wanted to take this opportunity to inform everyone that the city of Tampa has published a map of the BayShore area showing all acceptable street parking during the Gasparilla festivities. I have included the link below and ask that you please make sure all your guests view the map to prevent any parking issues over the weekend. If you have any additional questions or concerns please contact the office at 813-514-6800. Read more about Gasparilla Local Street Parking! We wanted to remind you that during the upcoming Gasparilla weekend, our tow company will be towing any vehicles that do not have a parking permit displayed. If you have not already done so, please stop by the Palma Ceia leasing office to obtain one by Friday, January 25 th . As a reminder, only one permit is allowed per resident, so if we have record of a previous pass, we will not be able to issue an additional one. We welcome any questions you may have and hope you all have a wonderful and safe weekend! So if I understand correctly, in Palma Ceia, none of the 10 guest spots can be used this weekend? And also, a reminder? Where was the first announcement about this rule? I was just getting ready to ask the same question. The last parking reminder that I received was on 10/31/18 and clearly stated that towing would only be enforced after the hours of 7AM - 7PM Monday - Sunday. So towing only applies during Gasparilla weekend? Unclear what the standard rules are. Thank you for the questions! I apologize for the miscommunication. Visitor parking will remain visitor parking and a parking permit is not required. Standard towing policies still apply outside the hours of 7AM-7PM. With it being Gasparilla weekend, we wanted to remind everyone of the importance of making sure your parking permit is displayed as parking in the area will be very limited. Ok awesome, thank you for the clarification! Hey just wanted to point out that you guys just put notices on everyone's door about the parking in Palma Ceia this weekend, using the exact same wording as above. Saying all vehicles without permits would towed. Definitely makes it sound like that includes guest parking as well. Just want to be really clear on it. Thanks! I just got home from work and there was no parking available in Eusonian. There are a few cars with no decals. After a long night of work, I would like to be able to park where I live. Mckinley Hyde Park Holiday Office Hours! Read more about Mckinley Hyde Park Holiday Office Hours! Just a heads up. I will be calling TPD on my lunch break to have them come out to have an official report. Please be cautious and send a message to nearby residents. Thank you for reaching out to us and making us aware of this incident. I am very sorry to hear that this happened to you. You are doing the right thing by contacting the police department and reporting it. Please keep us informed of any other information you may have. We are pleased to announce that all grills have been cleaned and all firepits are working properly. We wanted to ensure that you and your family and friends were all set to enjoy this Holiday weekend! I don't think the beach flats were serviced. There's no tank for the grill and the fire pit one needs to be replaced unless that was done today already. Can you please verify? In observance of the Thanksgiving holiday we will be closing the office tomorrow, 11/21/18, at 3:00 pm. Our leasing office will re-open on Monday, 11/26/18 at 10:00 am. Emergency maintenance will still be available during this time if something does arise. Emergency maintenance can be reached at 813-514-6800. Please follow the prompts for assistance. Please have a great and safe holiday! Happy Thanksgiving from the McKinley family to yours! Read more about Holiday Office Hours!